Recently, one of our customers (and owner of Cruise Planners) invited us to support a 3D printing cruise. We are honored to participate and can’t wait to spend three days with you during this exclusive experience! 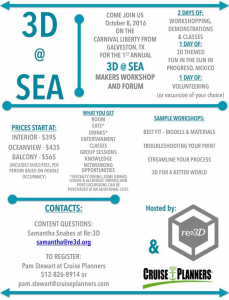 3D at Sea is the first of it’s kind 3D Printing Workshop and Seminar at Sea. This Workshop will feature 3D Printing Experts both teaching and speaking on a variety of relevant topics. There will also be opportunities for community impact work in Cozumel, in addition to general fun and networking! 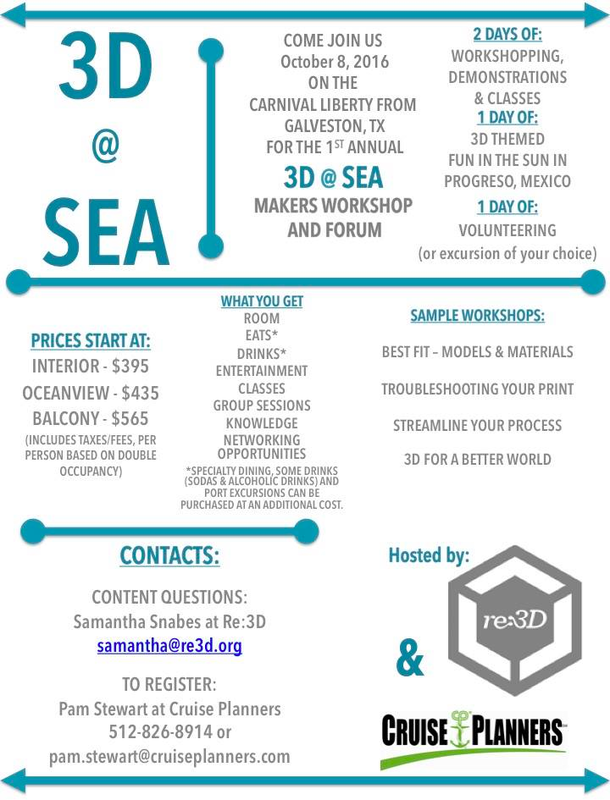 Anyone with a passion for 3D printing is welcome to join us on the Carnival Liberty out of Galveston on 10/8/16! Pam, the organizer, is also accepting applications to speak or teach a class until May 5th. You can share your interest on Facebook at: www.facebook.com/3datsea/ or email Pam directly at: pam.stewart@cruiseplanners.com.